Line 6 has made available its StageScape M20d, a smart mixing system for live sound. Featuring a touchscreen visual mixing environment, StageScape M20d streamlines and accelerates the process of getting live sound. DSP power delivers comprehensive professional audio processing on every channel including multi-band feedback suppression, the company says. Multi-channel recording, remote control capabilities via one or more iPad devices make the StageScape M20d an ideal mixing solution for a wide variety of live sound applications. 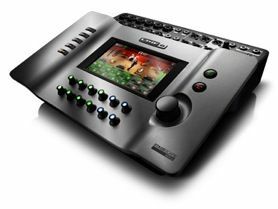 A visual mixing system replaces the traditional mixer channel strip with intuitive touchscreen control. In Perform Mode, a graphic display of the stage setup uses icons to represent each performer or input. Color-coded encoders provide immediate access to level control. A single touch on a performer’s icon gives access to all parameters relating to that channel, from basic tweaks to deep effects editing. The audio signal chain can be controlled via an innovative X-Y tweak pad. Drag a finger toward common sound descriptors like “bright” or “dark” and multiple parameters adjust simultaneously to achieve that sound. Deep Edit mode gives more experienced operators access to every effect parameter via a familiar plug-in style interface. StageScape M20d streamlines setup with auto-sensing mic and line inputs and outputs that can detect when a connection is made and automatically configure the channel gain, EQ, effects and routing. A host of recording options are also available. StageScape M20d provides multi-channel recording in high-resolution, 24-bit WAV files to SD card, USB drive or direct to computer, enabling musicians to easily capture every rehearsal and performance. Taking full advantage of Line 6 audio processing expertise, StageScape M20d features professional-grade effects on every channel, including fully parametric EQs, multi-band compressors, feedback suppression and more. In addition, four master stereo effects engines are available, comprising studio-quality reverbs, delays and a vocal doubler. Musicians can configure channel effects quickly with a wide range of channel presets that cover everything from individual drum settings to lead vocals. Musicians can control the mixer from any location by using one or more iPad devices with StageScape M20d. This makes it possible to set individual monitor mixes from the stage, or adjust the front-of-house mix from any location inside the venue. Equipped with the L6 LINK digital networking protocol, StageScape M20d allows musicians to easily configure and control complete PA systems of any scale. Connect StageScape M20d to L6 LINK-enabled StageSource speakers and the system automatically configures stereo signals and effects, sets individual component levels and adjusts individual speaker performance.